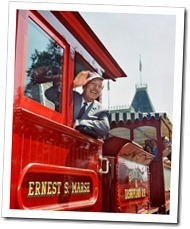 The Disneyland Railroad (along with the Disneyland Monorail and the Disneyland Viewliner) was privately owned by Walt when Disneyland first opened. The company that operated them was RETLAW (Walter, spelled backwards.) It wasn’t until the mid-1980’s that the Disney Company took control of RETLAW’s operations in the park. The Disneyland Railroad consists of five locomotives: #1 E. P. Ripley (1955), #2 C. K. Holliday (1955), #3 Fred Gurley (1894), #4 Ernest S. Marsh (1925) and #5 Ward Kimball (1902). All engines are real steam locomotives that burn atomized liquid fuel in the firebox to boil water that is fed from the tenders. Some guests think the engines are just props and adding water from the water towers is just for show – but they’re the real thing! 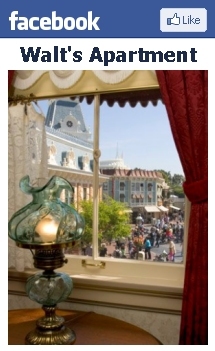 There are four stations: Main Street Station, New Orleans Square Station (formerly Frontierland Station), Toontown Depot and Tomorrowland Station. J.F.K. at Disneyland Here’s an October 1959 photo of John F. Kennedy‘s only visit to Disneyland. He was the the Senator of Massachusetts at the time and was here with the President of Guinea, Ahmed Sékou Touré. The Disneyland Railroad (originally the Santa Fe & Disneyland Railroad) is narrow gauge (36″ between the rails) and operates five live steam locomotives. Named after Cyrus Kurtz Holliday (1826-1900) who founded the Atchison & Topeka Railroad in 1859. Named after Edward Payson Ripley (1845-1920), the first president of the Atchison, Topeka & Santa Fe Railway in 1895. Named after Fred G. Gurley (1889-1976), President of the Santa Fe Railway from 1944-1957 – who approved the relationship between Santa Fe and Disneyland. Named after Ernest S. Marsh (1903-1975), president of the Santa Fe Railway from 1957-1966 and a strong advocate of the Santa Fe and Disneyland relationship. Named after Ward Kimball, one of Walt Disney’s animators. This engine was called the “Maud L” when it was at the Cedar Point Amusement Park.